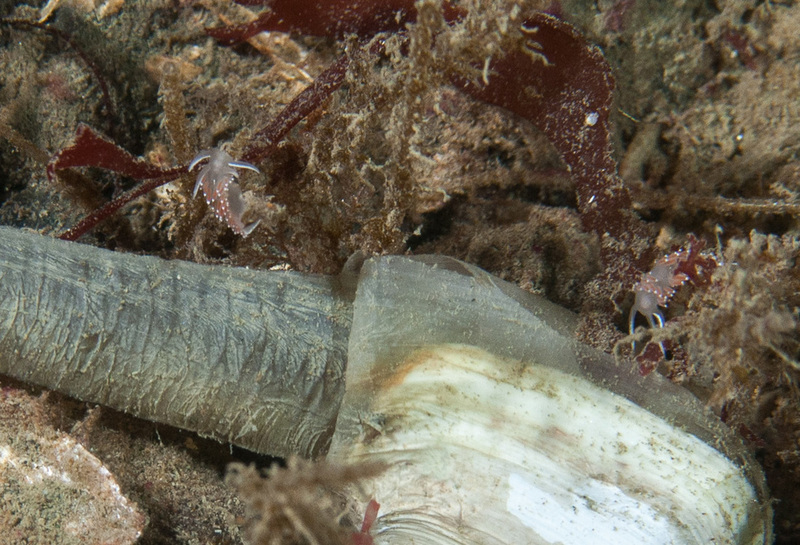 Two small red-gilled nudibranchs beside a geoduck. Photo by Wiebe Nijland. 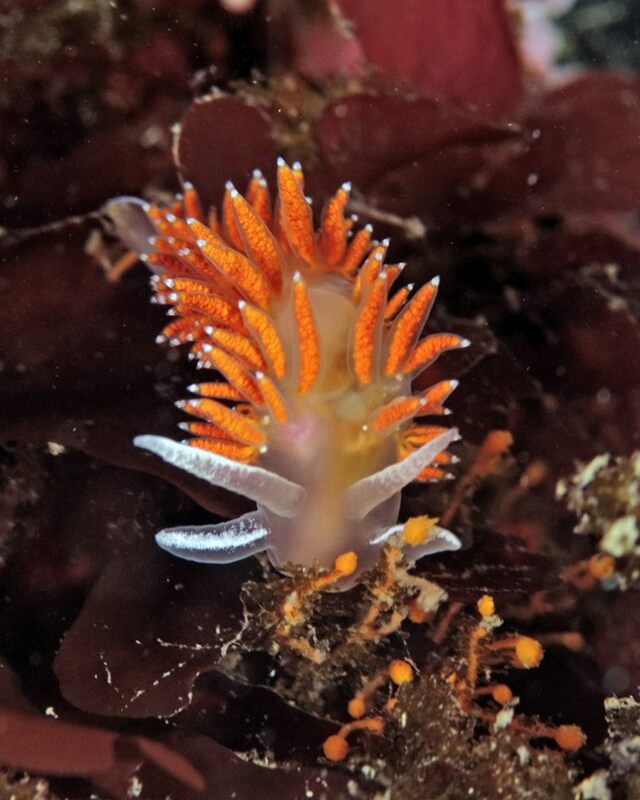 ​This translucent white nudibranch can be identified by its somewhat clumped long and thin cerata, which usually have reddish or orange cores — though this colour can vary with diet, as the cerata cores are digestive glands. The cerata have opaque white tips encircled by a bright white ring that is only distinctly visible on close inspection. There is a white line along each oral tentacle and possibly on the rhinophores as well. A broken white line runs along the centre of the back, becoming more continuous along the tail, but this line is usually obscured from view by the cerata clumps.This nudibranch can reach up to 10 cm in length, though is usually much smaller (1.5-2.5 cm). ​This intertidal and subtidal nudibranch has been recorded to 300 m deep. It commonly inhabits areas of high current, and on the west coast of North America is found from southern Alaska to northern Washington. It has a circumboreal distribution: other than the Pacific Northwest, it has also been recorded in waters off Britain, Norway, Iceland, Greenland, along the east coast of North America as far south as Maine, and in the Sea of Japan. The three-lined nudibranch (Flabellina trilineata) looks quite similar, but can be differentiated in a few key ways. Its cerata form more distinct clusters, its rhinophores and oral tentacles are usually tipped with orange, and it has three bright white lines running along the length of its body: one on each side, and one down the middle. Click here for images of these features. These two species are often found together. The red-gilled nudibranch feeds and spawns on hydroids, especially pink-mouth hydroids (Pinauay spp. and Tubularia indivisa). Flabellina verrucosa (M. Sars, 1829). In Sea Slug Forum. Australian Museum, Sydney. Accessed 26/01/2016. Picton, B.E. & Morrow, C.C. (2015). Coryphella rufibranchialis (Johnston, 1832). Encyclopedia of Marine Life of Britain and Ireland. Accessed 26/01/2016.